A Spanish grandmother who became an Internet sensation after dubbing herself the "world's oldest blogger" has died aged 97. Maria Amelia Lopez, who died Wednesday, began blogging from her home in Galicia two years ago, winning a raft of fans with her eclectic mix of commentary and nostalgia infused with a sharp wit. 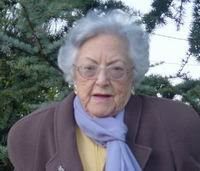 She was introduced to the Internet when her grandson set up the blog as a gift to mark her 95th birthday. It proved a great escape, Lopez later writing: "On December 23rd 2006, my grandson gave me a present, this blog when I was 95 years old ... and my life changed ... now, I can communicate and interact with the world." She wrote and video blogged about her experiences opposing Franco's regime, modern politics -- covering topics ranging from the Basque separatist threat to Iran's nuclear ambitions -- and poignantly discussed what it was like to grow old. Her family have left one final post, thanking readers for their support. "[There were] 880 days when her blog made her happy... the support she needed to enjoy her last days of life," they wrote.